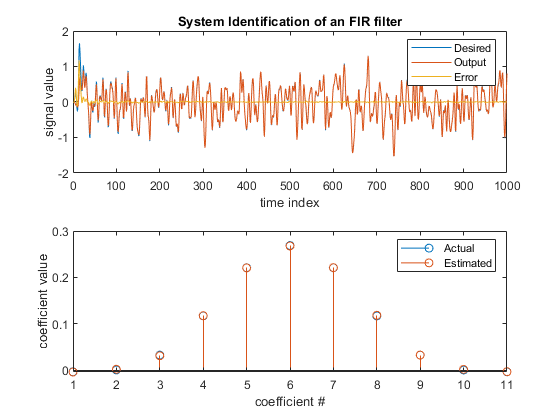 The dsp.FastTransversalFilter computes output, error and coefficients using a fast transversal least-squares FIR adaptive filter. Create the dsp.FastTransversalFilter object and set its properties. ftf = dsp.FastTransversalFilter returns a System object™, ftf, which is a fast transversal, least-squares FIR adaptive filter. This System object computes the filtered output and the filter error for a given input and desired signal. ftf = dsp.FastTransversalFilter(len) returns a dsp.FastTrasversalFilter System object with the Length property set to len. ftf = dsp.FastTransversalFilter(Name,Value) returns a dsp.FastTransversalFilter System object with each specified property set to the specified value. Specify the method used to calculate filter coefficients as either 'Fast transversal least-squares' or 'Sliding-window fast transversal least-squares'. For algorithms used to implement these two different methods, refer to . This property is nontunable. Specify the length of the FIR filter coefficients vector as a positive integer value. Specify the width of the sliding window as a positive integer value greater than or equal to the Length property value. The default vale is the value of the Length property. This property applies only if the Method property is set to 'Sliding-window fast transversal least-squares'. Specify the fast transversal filter forgetting factor as a positive scalar in the range (0,1]. Setting this value to 1 denotes infinite memory while filter adaptation. Setting this property value to 1 denotes infinite memory while adapting to find the new filter. For best results, set this property to a value that lies in the range [1-0.5/L,1], where L is the Length property value. This property applies only if the Method property is set to 'Fast transversal least-squares'. Specify the initial value of the forward and backward prediction error vectors as a positive numeric scalar. This scalar should be sufficiently large to maintain stability and prevent an excessive number of Kalman gain rescues. Specify the initial value of the conversion factor of the fast transversal filter. 'Sliding-window fast transversal least-squares' –– This property must be a two-element numeric vector. The first element of this vector must lie within the range [0,1], and the second element must be less than or equal to -1. In this case, the default value is [1,-1]. [y,err] = ftf(x,d) filters the input x, using d as the desired signal, and returns the filtered output in y and the filter error in err. The System object estimates the filter weights needed to minimize the error between the output signal and the desired signal. The signal to be filtered by the fast transversal filter. The input, x, and the desired signal, d must have the same size and data type. The data input can be a variable-size signal. You can change the number of elements in the column vector even when the object is locked. The System object locks when you call the object to run its algorithm. The fast transversal filter adapts its filter weights, wts, to minimize the error, err, and converge the input signal x to the desired signal d as closely as possible. You can access the current filter weights by calling ftf.Coefficients, where ftf is the fast transversal filter object. The input and the desired signal must have the same size and data type. The desired signal can be a variable-size signal. You can change the number of elements in the column vector even when the object is locked. The System object locks when you call the object to run its algorithm. Difference between the output signal y and the desired signal d, returned as a scalar or a column vector. The data type of err matches the data type of y. The objective of the adaptive filter is to minimize this error. The object adapts its weights to converge toward optimal filter weights that produce an output signal that matches closely with the desired signal.